We are a family business and although the business has grown with staff specialising in areas we still work as a team. Ian has always had a passion for quality cars and from a boy with the ambition to own his own garage. 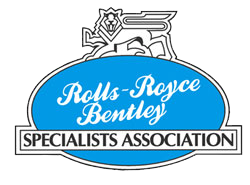 Having completed his apprenticeship restoring Rolls-Royce and Bentley Motor cars and having a passion for these marques RR&B Garages was formed in October of 1984 with Ian’s sights set on providing one of the best service and restoration facilities for these fantastic motor cars. 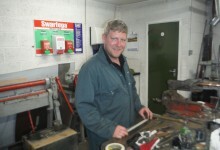 Although most of Ian’s time is taken with front of house duties, he takes a pride in the fact that he still keeps his hand in in the work shop and with Ian’s wealth of experience he is often seen in the work shop assisting with fault diagnostics and road testing duties. Ian’s favourite cars:- pre-war is the Rolls-Royce Phantom II Continental as this in Ian’s opinion is what made Rolls-Royce the quality car that they are renowned for being. Post war:- the Bentley S2 Mulliner Continental as this is undoubtedly the best post war classic that will give any modern car a run for its money. Matt is our General Manager and has over thirty years experience in the motor trade, he shares our passions for the high levels of customer care and strong work ethics that have helped to make what our business stands for today. Matts appointment means the founder and managing Director Ian Pinder can continue to put his skills and expertise to work in the maintenance and coach work side of the business. This will give support to the ever increasing work load and restoration projects that arrive here from all around the world. Darren joined our company in 2007 to manage our workshops, Darren brought with him an immense experience and wealth of knowledge for a young man for pre and post war Rolls-Royce and Bentley Motor Cars and has a great respect from many owners who have experienced his enthusiasm for these motor cars. 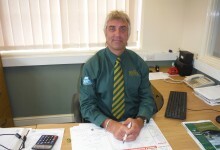 Whatever your service or maintenance requirements Darren will be there to assist. Angela is responsible for all aspects of office administration. 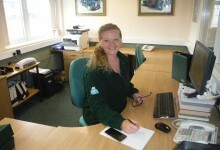 She is the friendly and helpful voice you hear when you call RR&B Garages and very efficiently and professionally meets and greets our clients who visit us here at Bromsgrove. Angela has a wealth of experience in all aspects of office administration and is always happy to help you with whatever your enquiry might be. Angela’s favourite car is a Bentley Continental GTC. Jamie joined us from school as an apprentice in 2004 and thanks to Bromsgrove Technical College, the RRBSA training days and our own experienced staff Jamie’s knowledge for motor vehicles and more importantly the Rolls-Royce and Bentley brands is exemplary. Jamie has recently taken on the role of Senior Vehicle Technician which will put his wealth of knowledge and experience to the test. He said ” I’m really excited about taking on the responsibilities of the roll and the challenges that it will bring. I work with a great team of people and I’m looking forward to helping them, especially some of the newer recruits during their early development and learning stages. Luke is our Trainee Vehicle Technician. His love of cars started very early on in life and he could often be found at weekends assisting his father and brothers to maintain a multitude of different cars for family and friends. RR&B Garages are very proud to be a part of Luke’s further education as he has now been awarded his qualifications from Bicester Heritage College where he studied for two years. He gained his qualifications by attending a one day release college course every week and worked exceptionally hard to achieve this great accolade. Luke said he found the course very informative and rewarding and looks forward to the mechanical challenges ahead. Having spent twelve years in New Zealand helping to restore and repair a multitude of different classic and modern day cars , Martin felt it was time to return to the UK and landed back on these shores in September 2017. 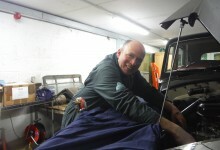 He brings with him a wealth of knowledge and experience which he has gained over the last twenty years and has been restoring and maintaining classic cars since he was seventeen. Whilst he is a new recruit to the Rolls-Royce and Bentley brand his passion for the upkeep and survival of the classic car fraternity is unsurpassed. Martin commented ” I’m really excited about being part of the team who help to process these amazing motor cars through their restoration programmes. 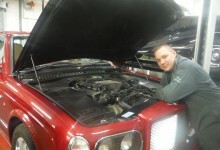 Greg has re joined RR&B Garages after a brief absence working outside the Rolls-Royce and Bentley fraternity. Using his wealth of experience and Knowledge gained over 40 years he has found it easy to re immerse himself back in amongst the ever demanding environment of a busy Rolls-Royce and Bentley Specialist. He is carrying on from where he left off and is already enjoying being back in familiar territory. Phil is only happy when he is bashing metal, whether hand wheeling a new panel for a pre-war car or fitting a new panel on a current Bentley GT. Phil will not say that he is finished until the job is finished to perfection with the panel gaps to a standard as if they have never been replaced. It doesn’t matter how difficult the coach work task Phil will always get it sorted. Phil’s favourite car :- Too many to choose from! Jim is our master painter from the old school. Rectification of a scratch to a full bare metal repaint, Jim ensures the perfect finish but this only comes with his skills and hard work. Out of all the jobs we complete it is Jim’s high gloss mirror finish paint work that gets the positive comments. Edward is our valeter and work shop assistant, he has come from an engineering background and is always happy to assist his colleagues when they need a second pair of hands. 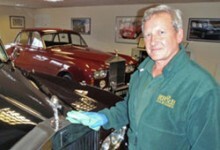 Edward’s work is what you see as he is responsible for the valeting and polishing of the motor cars. His valeting experience has been gained from the valeting of his own Armstrong Siddly 346 Sapphire. If you request collection from the railway station, Edward may be the member of staff who will be there to great you. 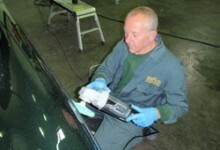 Mark has spent the last 13 years in the Automotive Refinishing industry and brings with him a wealth of experience and knowledge. His vast portfolio includes previously working with prestigious brands such as Aston Martin , Jaguar and Land Rover. 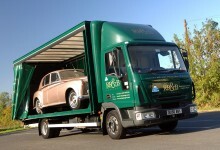 For many clients who choose to use our covered transport collection and delivery service our dedicated driver will be the only member of staff they will meet in person. Our drivers commitment to our clients is second to none and is always professional and courteous as well as taking pride and joy in the important job roll they do. Our drivers have a wealth of experience and over many years have been collecting cars for us from all over the uk and the continent as well. If you feel that you have the skills and attributes that we are looking for, we cannot guarantee a position but would welcome your CV for consideration.